‘A Pirates Tale' tells the adventurous story of pearl diver Ameer, as he fights pirates in his quest to rescue his beloved Ayesha from being held hostage and return the King of the Sea emerald ring. This story will be told through spectacular technology in water, pyrotechnics, lasers, lights and dramatic effects, including enormous ships, cannon ball effects, mermaids and of course, pirates! A giant ship, a life-size octopus, kids' play areas, and a sand play zone will come to life on Festival Bay this January. Shoppers are welcome to join in this adventure with daily entertainment for all the family. Activities on Festival Bay include a special Fun Park for kids, complete with carnival rides, giant slides and Dubai's only outdoor splash park. 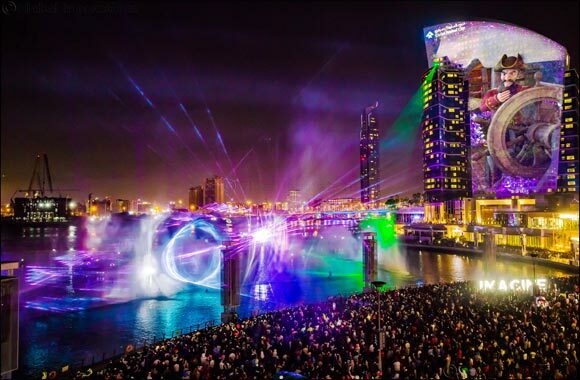 IMAGINE, a two-time Guinness World Records breaking attraction, transforms Festival Bay with its cutting-edge multi-media technology, boasting the largest water screen projection and the largest permanent projection mapping in the world. This unique sensory experience harnesses the power of light, water, and fire, combined with giant aqua screens, 30 fountains and surround sound to connect with audiences and produce a show like never seen before. Stay tuned! More will be revealed soon.